Helping children grow in MIND, BODY & SPIRIT! From K to 12th grade, our dedicated educators help instill a love of learning into each child. 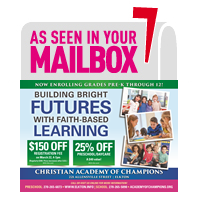 We strive to give every student an excellent education in a safe, faith-filled environment. Homeschooling and need help with one or two classes? We would meet at one location to pick up and drop off. If you are interested in this service, please let us know.